In Paintings and Sound, his recent exhibition at LIMN Gallery, Ted Vasin endeavored to merge a plethora of artistic fields and dimensions into one, comprehensive mélange. 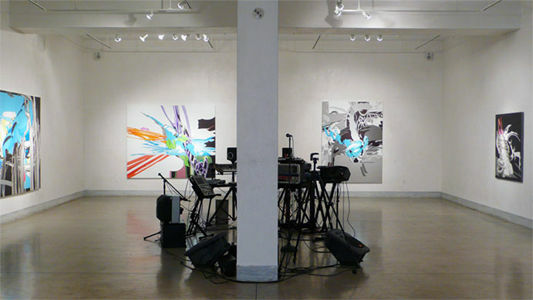 To begin to describe Vasin's imagery, one must draw on vocabularies from range of genres: abstraction, computer algorithms, graphic design, graffiti and Japanise animation. One element in Vasin's process is to employ software into complex designs and abstract configurations, overlapping swirling colors that range between pastel and confectionery to dark, rich hues. An example of this is The I Behind This I. Arbiter In White. In this diptych, Vasin positions caricaturized speakers within a dynamic landscape of floating vegetation and shadows. Vasin is almost disassembling the speakers as he assembles his subject matter with geometric shapes that outline one another. The simultaneously alternating colors highlight angles and suggest a resonating movement. Vasin's paintings almost come off more as illustrations than traditional paintings. In Four Ways To Do It, streams of paint jet across a luscious triptych background of ribbons of various shades of grey. The streams are composed of comic books purple eddies that come to circular fruition in residual splashes of liquid droplets. Vasin's layering of colors, lines and alternating planes of space infuses the paintings with animation. It is new form of abstraction that caught my attention. Vasin's technique inadvertently seems to be tackling the perception of abstraction. When one thinks about abstraction usually evokes an image of a painter working automatically or spontaneously. But with Vasin's use of computer software, it is almost as if he is interbreeding the past with a dose of the now, resulting a calculated (non-pejoratively) abstraction. However, his attempt to implement sound into the exhibition felt a bit amiss. Entering the gallery space, one encounters an island of sound equipment that was stationed in the middle. Emanating an almost ghost-town quality, the abandoned equipment was a vestige of the artist's opening night performance. For those who were unable to attend this event in addition to the gallery piping in the artist's synthesized music, there is a Web site. For me, it was a luckbuster. Vasin was attempting to blur the lines between the exhibition and installation. Watching the video online without the paintings around me, or viewing the paintings with the music coming though the speakers while the equipment gathered dust in the middle of the floor detracted from the experience. Without this element, titling Paintings and Sound is really just setting up the viewer to be a bit disappointed by the confusing and nonsensical post-performance detritus. Yet, I can't help but wonder what else Vasin may have up his sleeve as he works towards some sort of resolution within all he purveys.